I just finished posting photos and information on the various bookmarks I received as part of the 2006 Handwoven Bookmark Exchange. I feel this was one of the best exchanges I have ever participated in. Each and every weaver really put their hearts and minds into their creations. The results speak for themselves. What a great feeling! 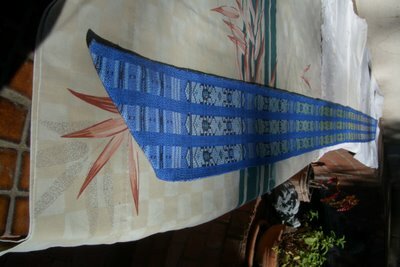 I finished up weaving this scarf this morning. let it rest a bit, wet it down a bit and spread it out on the back patio to dry. Just a bit of sewing and it will be finished! A better picture will be forthcoming! I have been weaving steadily on my taquete scarf for the last several days. I could take a picture...but it would look almost like this...but with 44.5 inches woven and visually it now has a bit more green. 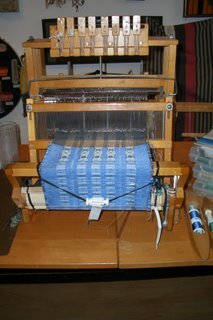 A few more days of steady weaving and it should be complete. I have modified my color scheme a bit...I am running through pale greens into pale yellows - which with all the blue will still tilt towards green...the change in color is subtle...no one may notice except those who sit next to me and are bored with whatever is going on and just stare at the scarf for awhile. Each beetle is also different...I have designed some new ones and added some old favorites. I kept with a similar design as the bookmarks - it is essentially nine bookmarks with a different design added for the top and bottom. I am almost out of black thread...I've got a 40% off coupon for Joann's so a field trip is in order for today. First I think I will go and finish a module of beetles - -I am using a variegated thread for the first time. The effect is interesting to watch appear as I weave. A Seattle potter stopped on Sunday accompanied by one of my dear ol' good buddies and - - bearing gifts. 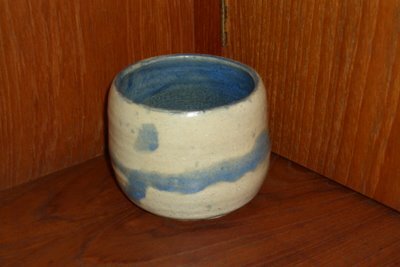 We got this lovely handmade pot and they got to taste our micro-brew. Next time I see him, I must have him sign and date my pot. Who knows perhaps it will go up in value! Ah I feel so productive...I am finally weaving on my Purrington eight harness table loom...one of my favorites for taquete. It took forever to warp this one...but I am finally weaving and so I am content. And what am I weaving? Bugs of course. I am again in search of something to wear with blue jeans...I seem to have no blue accessories. So a lovely blue bug scarf is on the way. One foot done [or twelve bug feet] and about five more to go. Not bad for one day of weaving! I am doing high value gradations from pale blue through lite yellow greens into the pale yellows and back again to lite blues. I am putting Sulky holoshimmer thread in sea green, two blues and a yellow green as accents for the inside of the bugs. The entire palette is close to a high major key so it will be interesting to see if it evokes boldness, strength and positive energy or if it will shift towards the high major with more of a peaceful and calm feeling. I just got notification that the Grand Ideas catalog is now viewable on-line. This is the annual exhibit of small tapestries - this year it is showing in June in Grand Rapids. It is always a fun exhibit since it has both experienced as well as new weavers displaying their creations and the pieces must be no larger than 10 " by 10" or actually 100 sq inches. Check it out. My creation "Mr Clean" is in the Gallery Section on page 23. The students took an excellent picture...I like how his white shirt just pops off the page. There are also some fabulous other tapestries...some which are just awe inspiring. Exhibits like make should make everyone want to become a tapestry weaver!